View cart “Faceted Amethyst, Iolite, Black agate slab” has been added to your cart. This striking, ‘knockout’, pendant ‘can’t be ignored’. As an adjustable necklet/short pendant, it will make the wearer the centre of attention. 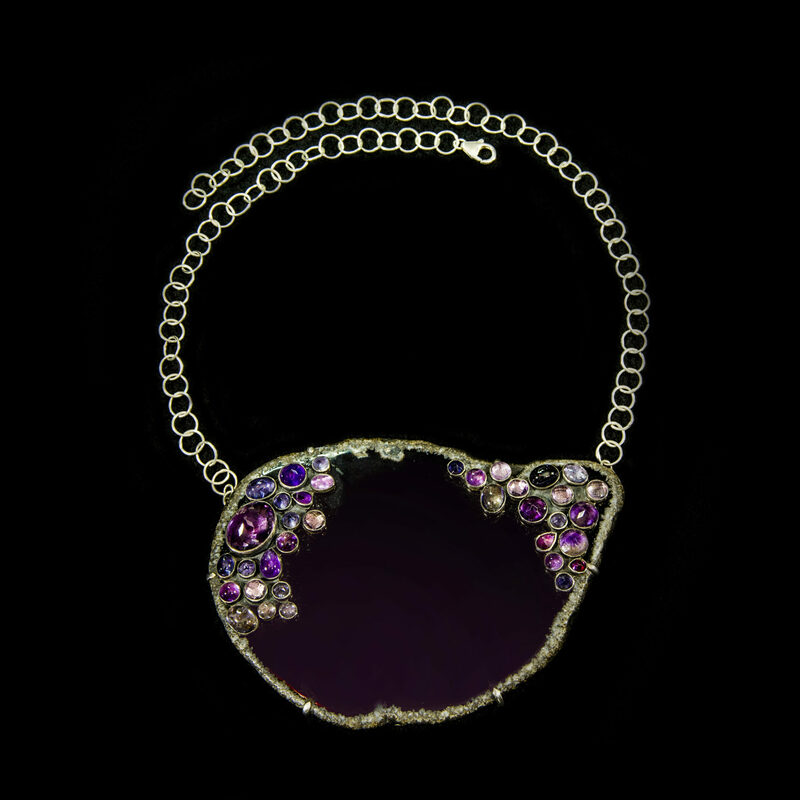 The amethyst and iolites are so lively they loom out of the oxidized sterling silver black (setting) background and insist on the viewer’s attention. The adjustable silver chain is not oxidized. (Oxidization is only used here to allow the gems to ‘melt’ into the black agate background). The pendant can be worn successfully in a variety of stylings: Boho, to office, dinner and also casual clothing. Black Agate and Amethyst Chest Piece, for the bold, bright female warriors of our time. This image is (in my mind) an imaginary, ethnic warrior woman of Europe or Eurasia (no special time period). I imagine her as a tribal woman who has woven & embroidered her shawl & hat – yet she might also be a contemporary woman dressed in boho style. The black agate slab is strong, stylish & the great thing is – it can be worn with many different styles of outfits, dressed up or down, with black, purple, navy, grey, cream, white & silver in work suits, evening dress and will take the wearer from day to night for the mother, worker, professional, scientist, medico, educator & CEO (warrior woman). Warrior Woman is the one who has survived office politics, career-building, abuse, war, violence & loss but gets up again to survive another day. Warrior woman is you … Warrior woman is me.